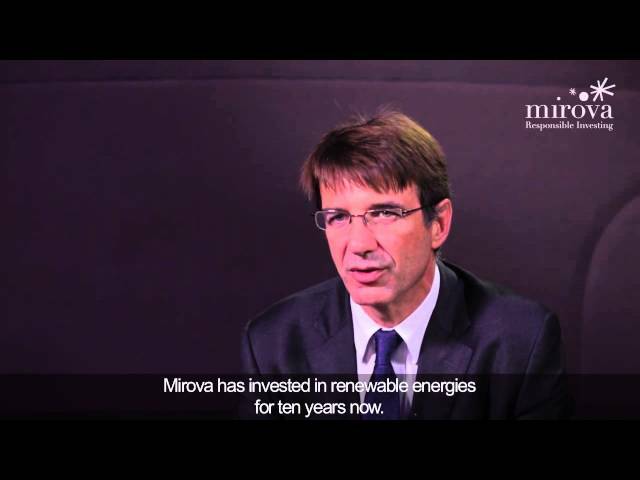 CIO for Sustainable Equities at Mirova, Jens Peers, discusses the increasing importance of financial performance in SRI portfolio construction and areas where he is identifying strong sustainable investment opportunities. With many investors still in defensive mode and focused on avoiding losses above all, is responsible investment on their radar? In short, yes. Pension funds, in particular, realise that having a focus on the short term – the next quarter’s results and maximising profits – is not the best approach. The financial crisis has shown this. A lot more asset managers and asset owners have signed the UNPRI in recent years and that means they have to obey the rules of the principles. At the start, this was just about filing a simple report, now really they have to integrate the information into their portfolios. Many consultants, too, have set up specialist analysis departments. Almost every RFP, even for non-SRI mandates, now has an element of ESG or SRI in either the research or portfolio construction, or both. The trend is very strong and will only get stronger. What do investors expect from SRI allocations? Some pension funds add SRI as an overlay and are looking to minimise risks associated with SRI. But overall, we think investors are increasingly interested in looking at SRI in a positive way and want to invest in companies that will outperform because they are aligned with long-term SRI-related factors. We invest in companies that we think will shape the world a decade into the future. The world will have a lot more people, more older people, and those people will increasingly live in cities and in emerging markets. In emerging markets, behaviour will change and people will live and eat differently, impacting climate change and natural resources. The financial system will be different too. Governments will have less money to spend and financial services groups will have to play a bigger role in society. Which sectors are likely to respond best to these challenges? We have identified eight sustainable themes that most of our investments fall into: Sustainable energy, mobility, buildings and cities, consumption, health, information and communication technology, resources, and finance. We mainly seek companies that offer “pureplay” solutions to the challenges of the future. Take water: we all need water, there is no substitute for it. So we invest in companies that produce pumps, valves, pipes and so on. Water is important for other sectors, such as energy; power plants need huge amounts of water and that requires filtration, pumps, pipes, metering, testing equipment, quality control and so on. The US, in particular, will invest enormous amounts on its energy infrastructure as it adapts from being an energy importer to an exporter. For instance we invest in companies that provide water treatment and distribution such as American Water Works in the US or SABESP in Brazil (San Paolo). Food is an enormous opportunity. Between now and 2050 the world will have an additional 2 billion people, who will all need to eat. The land bank is limited so there will be investment in technologies and equipment that increases yield per hectare. If you look at the average yield per hectare for corn in the US and Europe, it is perhaps twice as high as in China. Companies, with a global footprint such as Lindsay Corp (US, irrigation infrastructure) or Mosaic (US, fertilizers) provide technologies that substantially increase yields. If China invests in the same technologies as the US there will be no longer be a food issue. Do you only invest in “pureplay” SRI sectors and companies? We want to invest as much as we can in pureplay companies, but we exploit other long-term themes too. These include technologies that improve efficiency, such as building efficiency, medical equipment to service an ageing population, and the light-emitting diode (LED) market. The LED market is huge and doesn’t require subsidies for companies to profit from it. Building efficiency will be driven by consumers’ desire to save on their energy costs and also by regulation. Parts of the financial sector will also benefit. There will be opportunities for life insurance companies and asset managers linked to the ageing population. People will increasingly need to save for their own pensions now it’s clear they can’t depend on the state. Old-style banking – mortgages, infrastructure, financing – should also do well. How do you select companies with the best return potential? The investment process starts with identifying the best long-term opportunities, then looking for those companies that will outperform over three years. After that, we perform financial analysis, part of which includes extra-financial risks. Governance – the composition of the board, the independence of directors, ethical behaviours and so on – is important to this. Finally, if we are happy with the company, then we invest. We may engage with it if we feel it meets our long-term investment and financial criteria, but could perform better on SRI factors. Why do you bother engaging with companies? Why not just exclude them from your portfolio if they don’t meet your SRI standards? We are unusual in our approach to SRI investment. We are not trying to exclude companies and minimise risk, but prefer to focus on what we would like to include in our portfolios. If we like a company, but feel it could do things better, we engage with it. Our ESG analysis focuses on key sector issues, such as reviewing high-risk installations from an environmental perspective (eg gas extraction), the inclusion of shareholders in large-scale project management (eg the construction of large dams), or reviewing safety conditions (eg in nuclear installations). There are many opportunities for engagement with mid-cap and smaller companies, which don’t always have the experience or background to implement ESG criteria. We used our power as a shareholder in about 150 of our investments last year to encourage better reporting of ESG factors. Our belief is that investors don’t use their influence enough to change behaviour. What do you say to critics who think SRI portfolios underperform and carry more risk? I helped launch a water-themed fund about 12 years ago and that fund has outperformed the MSCI World in ten out of the last 12 years. In my opinion, it is just self-evident that sustainable themes will outperform over the long term. You don’t necessarily get more volatility. Some sectors, such as infrastructure, energy, water and food, can be volatile, but other sectors such as pharmaceuticals are more defensive and stable. We aim to cover the whole market and not take any single risk that makes SRI themes underperform as a combination. We also combine small-cap, mid-cap, mature and early stage companies to give ourselves as many tools and as much diversification as possible. The risks are little different to a global equity portfolio.